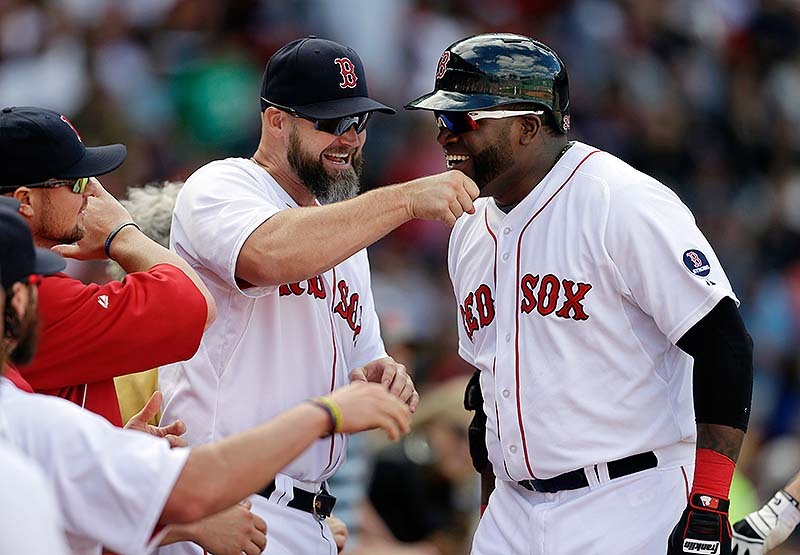 David Ortiz and Jackie Bradley Jr. hit homers in Boston's win. BOSTON — David Ortiz and Jackie Bradley Jr. homered to lead the AL East champion Boston Red Sox to a 5-2 victory over the last-place Toronto Blue Jays on Sunday in the regular-season finale at Fenway Park. Felix Doubront (11-6) pitched seven strong innings in his last start before moving to the bullpen for the playoffs. The Red Sox clinched the division title on Friday and, with 95 wins, have the lead in the race for home-field advantage through the AL playoffs. Koji Uehara pitched a perfect ninth for his 21st save. Kevin Pillar homered and added an RBI single for Toronto. Reigning NL Cy Young-winner R.A. Dickey (13-13) allowed five runs on six hits and a walk, with a season-high 11 strikeouts in his third complete game of the season. Doubront gave up two runs on four hits and two walks, striking out two in his first appearance since Sept. 6. He will move to the bullpen next weekend. Toronto took a 1-0 lead in the second inning on Pillar’s single, but Boston scored four in the bottom half on three singles and Bradley’s three-run homer. After the Blue Jays cut the lead to 4-2 on Pillar’s homer off the top of the Green Monster, Ortiz made it a three-run game with a towering shot into the Toronto bullpen. Ortiz was also given a double in the third inning even though replays showed he slid into second baseman Ryan Goins’ glove and should have been out. NOTES: Red Sox Manager John Farrell said he is optimistic CF Jacoby Ellsbury (broken bone in right foot) will be able to return on Wednesday, in time to get ready for the playoffs. … The Red Sox won 95 games for the seventh time since 2003.